It’s Christmas Day. Perhaps Santa left something shiny for you under the tree. But most likely any gift will pale in comparison to the bling worn by the Maharaja of Patiala back in the 1920s. He commissioned Cartier to craft his famous necklace from bucketloads of his gemstones, including the spectacular 235 carat yellow diamond pendant. Cartier created a reproduction of the necklace after the original disappeared. The Introduction to this book features the story of this famous necklace along with stories of other famous pieces. Who knew gents’ jewelry could be so bold, so dashing — and yet so tasteful? Hundreds of color photographs offer a sumptuous visual repast of traditional fare like rings, cufflinks and lapel pins. But the buffet offers savory dishes of brooches, stick pins, bracelets, pendants, chains and studs as well. The verso of the title page features my favorite piece: a Cartier platinum and white-gold panther brooch. The panther’s body is studded with diamonds and sapphires as he glares imperiously from yellow-diamond eyes atop his perch on an enormous Kashmir sapphire. This book is a visual feast — fit for a maharaja — and folks like us. This entry was posted in new stuff tuesdays and tagged men's jewelry. Bookmark the permalink. This looks like a fun book. I love the play on words in the title—how they sound similar. 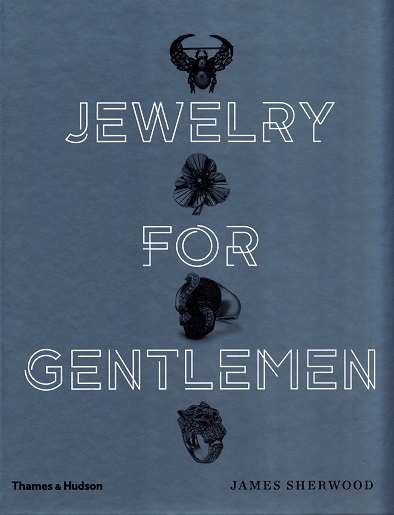 Perhaps there could be a follow-up book that shows gentlemen jewelry that is more on the rough side. Might we start with my clothespin necklace, circa 1994?